" 'Green News Report' - January 17, 2019	"
A stunning new study on Antarctic sea ice collapse greatly raises the risk of a 10-foot sea level rise this century if President Donald Trump’s climate policies aren’t quickly reversed...[T]he new study finds that parts of the vastly larger East Antarctic Ice Sheet (EAIS) are also disintegrating. A pair of new studies released on Monday share a same ominous message --- that our planet's ice is melting at an alarming rate, which is bad news for global sea levels. 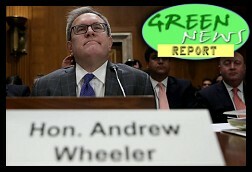 Andrew Wheeler, President Trump’s pick for Environmental Protection Agency (EPA administrator, testified before the Senate Environment and Public Works Committee. Mr. Wheeler was asked about his views on climate change, auto emissions standards, the Clean Power Plan and various EPA rule proposals. [I]f the hearing itself is any indication, Mr. Wheeler could be in for a rocky tenure. Wheeler proved that he’s deeply knowledgeable about the energy industry and EPA regulations, and that he’s more politically adept than his predecessor. The last major action Wheeler took before his agency shut down late last month was remove the legal justification for the EPA’s regulation for mercury, arsenic and air toxics, a move that weakens the EPA’s position in a court case pursued by, yes, [his former boss] Bob Murray. Business leaders and experts surveyed by WEF said that extreme weather, migration caused by climate change and natural disasters are the three risks they're most likely to face in 2019. « PREVIOUS STORY "The 'Low Barr' for Trump's AG Nominee and Other Notes from a 'Symphony of Lawlessness': 'BradCast' 1/16/2019"
"'Green News Report' - January 17, 2019"
Would you be able to have a guest to explain different parts of the Green New Deal. I had heard about it a couple years ago but was not aware it had been around for 20+ years. Several new members of Congress campaigned on the idea that they would push for introducing policies within the Green New Deal. What are the chances some aspects have a chance in the current House. Recent news reports indicate that leadership in the Dem party are not that interested in advocating for green policies from the green new deal. Curious to learn more about it.